On the six-year anniversary, PIX11 reported on how one Long Island community gathered to remember Superstorm Sandy and discuss a new initiative in honor of the residents and first responders of the disaster. Yesterday, Red Cross volunteers supported the local community and veterans at the 2018 Suffolk Country Marathon by distributing water, coffee, supplies, and operations management to event staff and runners. On Sunday Assemblywoman Christine DiBartolo Pellegrino teamed up with the Red Cross in support of fire safety, installing 59 smoke alarms in one day making the City a bit safer in the process. Congresswoman Yvette D. Clarke sponsored a Red Cross Emergency Preparedness Training presentation at the Brooklyn Shalom Senior Center on Sunday. Red Cross volunteer Greg Davidson is preparing for the TCS New York City Marathon, which he is running in support of the American Red Cross. Check out his awesome training video! 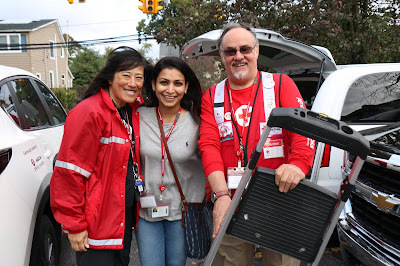 Clara Barton (who bears a striking resemblance to long-time volunteer Oonaugh Turrito) alongside fellow Red Crossers in Queens shared preparedness information with parents at PS 205Q on Friday. Trained by the American Red Cross, Amanda Robinson of WeWork helped save a choking colleague’s life in Brooklyn. She recently received the American Red Cross Certificate of Merit for her actions. Special thank you to National Grid and PSEG Long Island for supporting Thursday's American Red Cross Home Fire event! We also salute the Brentwood Library who also played a role in making this event a success. Thank you NYC Emergency Management First Deputy Commissioner Calvin Drayton for speaking to Red Cross staff last week about leadership and for sharing his insight on the past, present, and future of emergency management. In the latest #MyRedCrossLife Instagram post, Edras Hidalgo’s shared his story about how volunteering with the Red Cross is making a positive impact on his family. Oct 30, Nov 2 & 5: Red Cross blood drives will take place from 2 to 7 p.m. at the Greater NY Red Cross building located at 520 West 49th Street, Manhattan. Schedule an appointment to donate today! Nov 15: American Red Cross is hosting their inaugural Sunrise to Save Lives Breakfast to eliminate measles around the world through improved vaccination coverage. To purchase tickets, please visit: https://501auctions.com/sunrisetosavelives. For questions and sponsorship opportunities, please contact Dawn Neilson at dawn.neilson@redcross.org or 516-747-3500 ext. 203. Dec 13: Join the Red Cross Young Patrons’ Holiday Soirée for a night of conversation, drinks, live music and general holiday cheer at the beautiful and historic Players Club in Gramercy Park. To purchase tickets today!